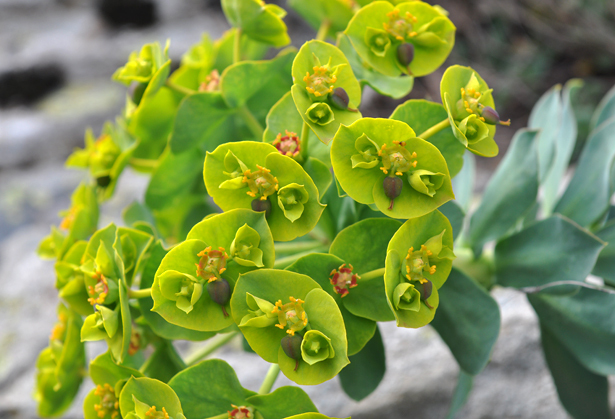 We go to the Madan area very frequently and usually do not write reports from those trips. 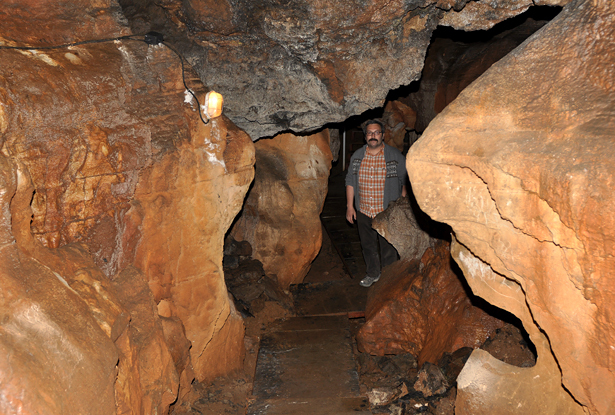 This time because of we decided to share some photos because we visited the underground and Meteora in Greece. In this report we also included a few photos from the previous trips to show some more of the Madan area. Because of a lot of information put in the photos` descriptions the text part of this report is much shorter than usually. This time we didn`t drive by car to Bulgaria but flew to Thessaloniki (Greece) and from there we went to Madan and spent there a few days. 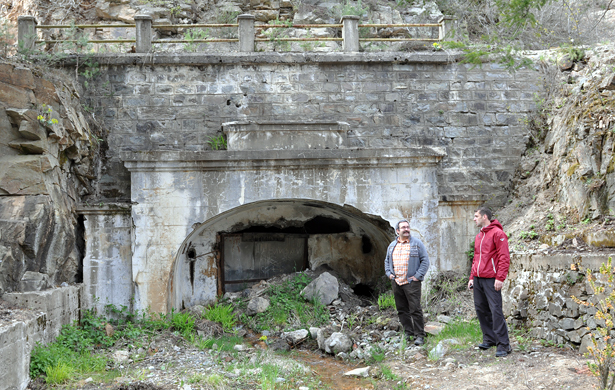 This time we visited a number of surfacial workings, old mines, active mines and museums. We also spent some great time with friends eating shopska salad, drinking beer and rakija. 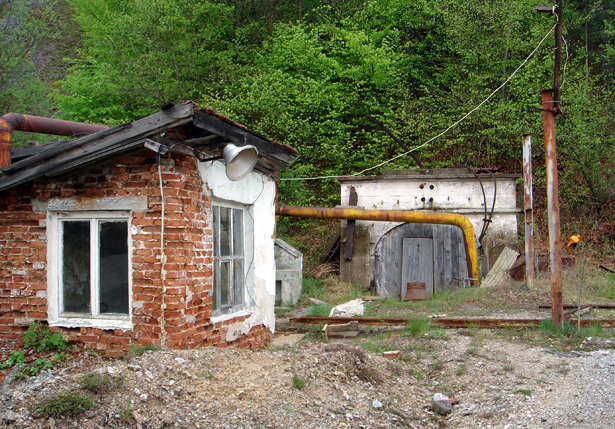 Madan is a classic mining town which developed very fast in the communistic period. 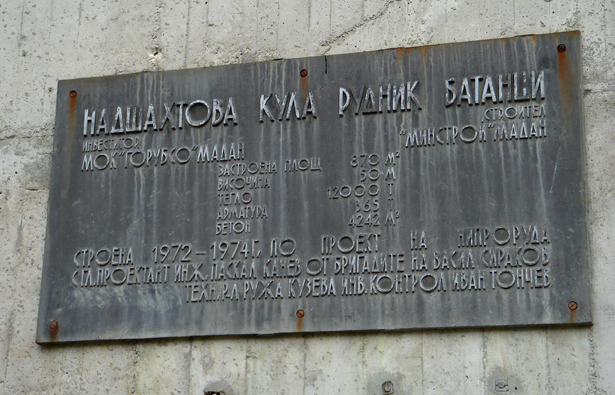 It was a very important mining and floatation center in Bulgaria so the communist goverment put a lot of effort and money do develop the area. 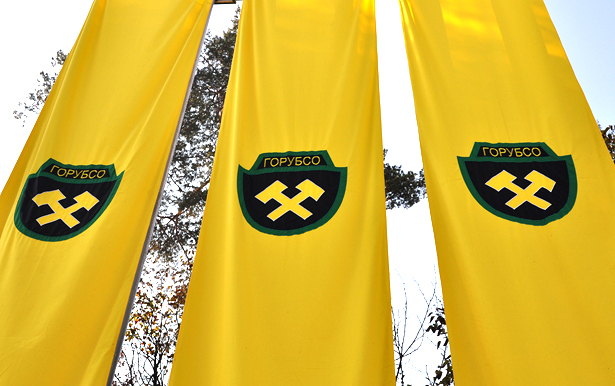 Because of so important position of the area at those times there was plenty of communist symbols, monuments etc. 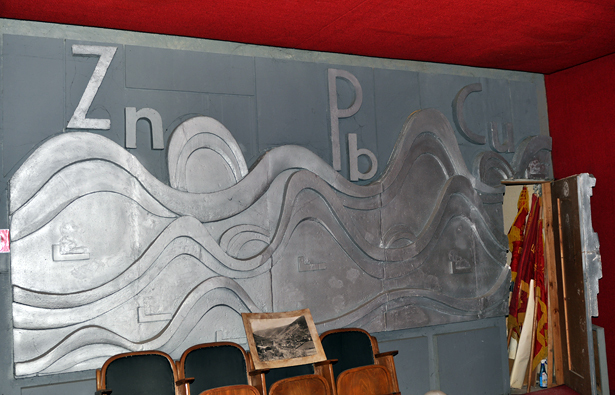 Because almost all of them survived to our times they are very visible today – monuments are located at the main squere and near the mines, red stars and Socialist Realism art may be found also in many places. We might say that Madan area is a kind of heritage park. I think that for foreginers from the Western Europe and USA it might be dificoult to understand many of those symbols and feel this specific atmosphere – for this reason we some explanations in the photos captions. It is also worth to note that today Madan is very different compared to its "great times". 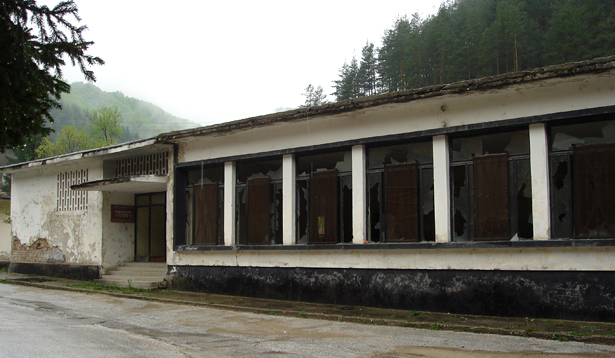 Many of the mines are closed, the number of employed miners is much lower (about 10% of the previous employment ), majority of the mining buildings are ruined and collapsed etc. 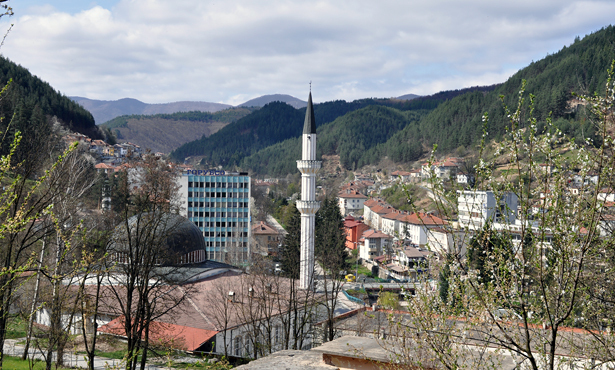 Of course the center of Madan, beside of communistic relicts, is a typical, small modern town. 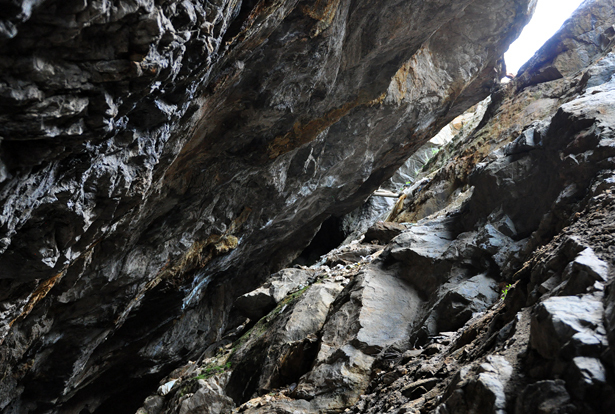 Geology of the Madan area is quite complicated, but simplyfing – old, Precambrian metamorphic rocks folded in the Alpine orogeny, are cut by hydrotermal veins rich in sulphides and carbonates. In the places where the veins arecut the Precambrian marbles the huge metasomatic, skarn zones are occuring frequently. 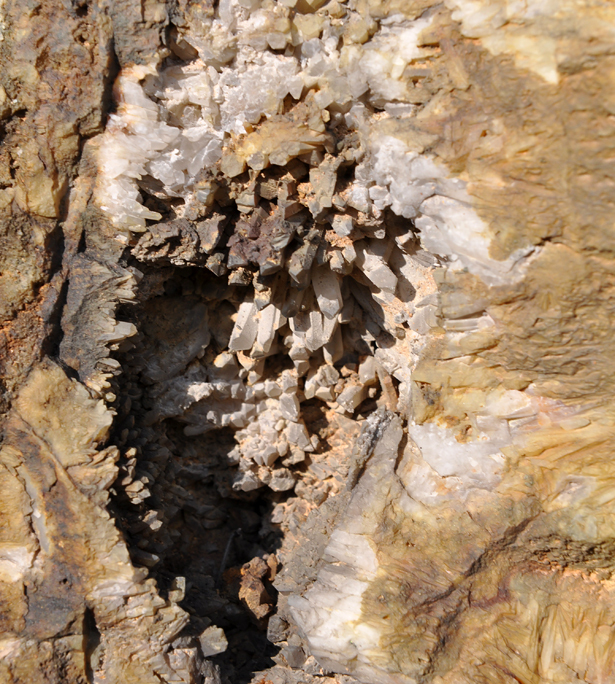 Those zones are especially rich in pockets and well crystalized minerals. Size of the pockets reaches several meters. 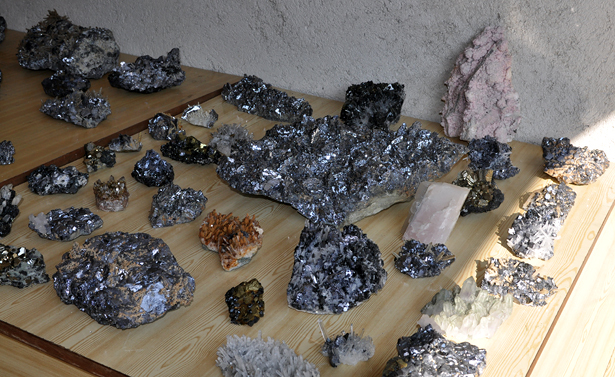 Their mineralogy is very simple – only quartz, calcite, dolomite, rhodochrosite, pyrite, sphalerite, chalcopyrite, galena occure in them. 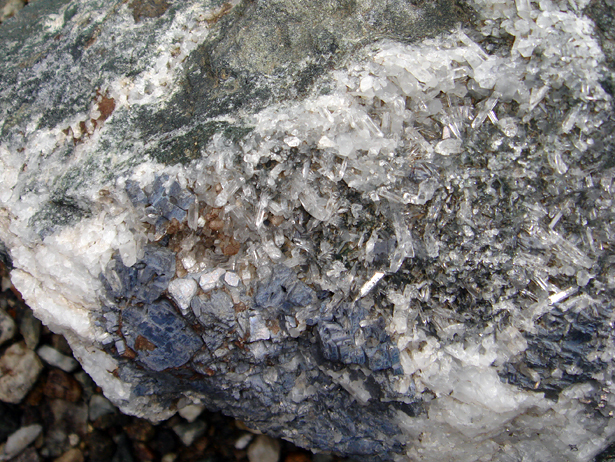 Different mines produce different style of mineralisation, and sometimes specific paragenesis. Of course up to 90-ties many more mines worked there were and very different paragenesis occuring. 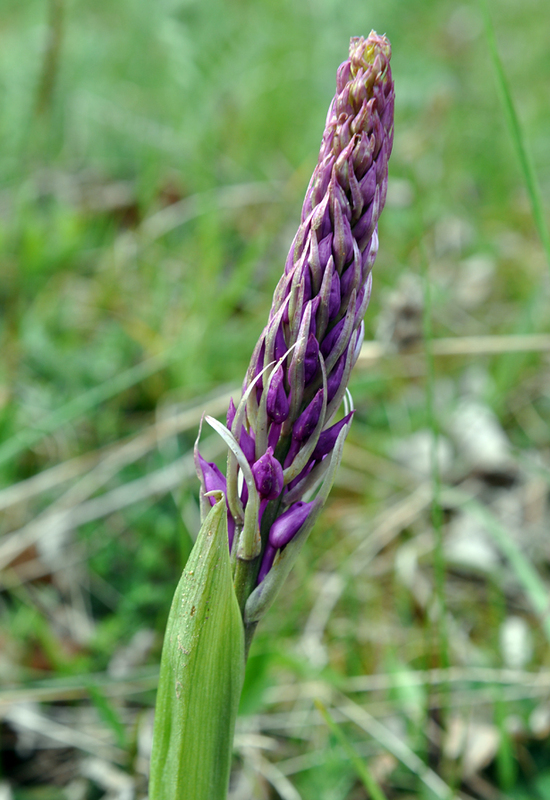 Probably the quantity of specimens was much bigger but not many people collected them. 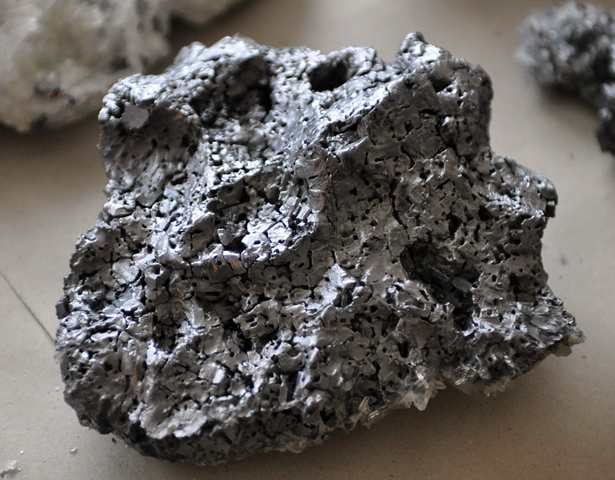 The last 20 years was the time when miners started to cellect minerals carefully and sell them to the dealers. Because of the increasing prices of metals today there is no plan of closing the mines, and it seems that they might work for many more years. 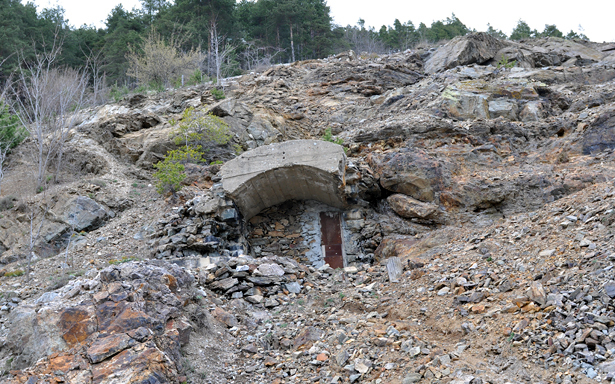 The most important mines producing the specimens are: Krushev Dol, Borieva, Gidiursko, Androvo and ocasionaly 9th September (closed but sometimes the local collectors work there). After the great time in Madan we went to Meteora. On our way we stopped in Kavala to eat frutti di mare and to see some Roman monuments. 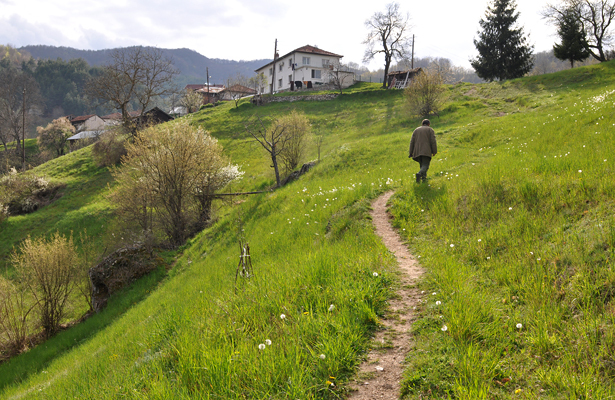 We arrived to Kalambaka - small town in the mountains - in the middle of night and in heavy rain. 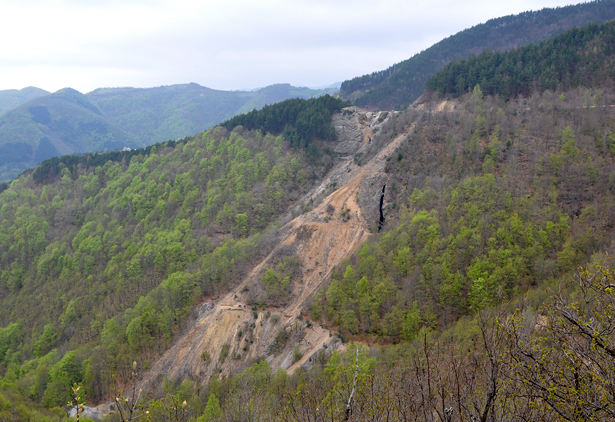 We were very surprised in the morning to see huge clifs of outlayers. As we studied the rocks we figured out that these are sandstones and breccias. The local river used to carve the rocks and formed very spectacular shapes. Very high, almost pinacle shaped outlayes, are famous for the monasteries that were build on the top of many of them. The Greek word Meteora means "suspended in the air", the Eastern Orthodox monasteries were built here starting in the middle of 14th century, but the monks are belived to live there already in the 9th century. Before the 20ties it was not possible to acces the monastries other way than in the corded basket pulled up by the monks, now each of them has the stairs curved in the roks, and some of them have cable railvays and lifts. Only 6 monasteries survived to our times. They are still inhabited by monks - 5 of them by men and 1 by women, there are no more than 10 people living in each of them, but today they have no problems with the communication with the outside world, in fact I think that the might have enough of tourists because it is now a very populat attraction in Greece. We really liked it. See Madan specimens in our store. See Madan specimens on our ebay. Map showing the area we visited during the trip. Map from Google Earth. 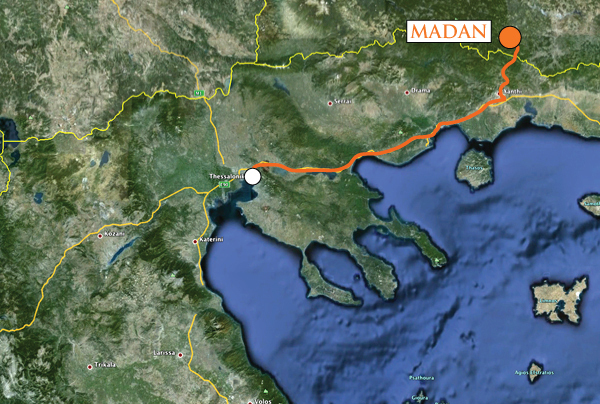 We flew to Thessaloniki and directly from there we drove to Madan. Map from Google Earth. 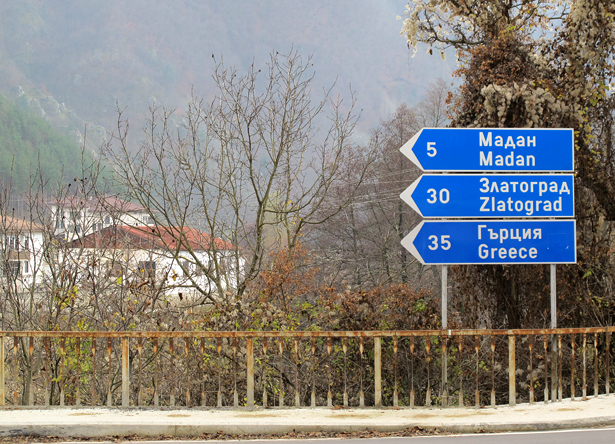 Road sign showing the distance to Madan and Zlatograd - two famous localities. T. Praszkier photo. 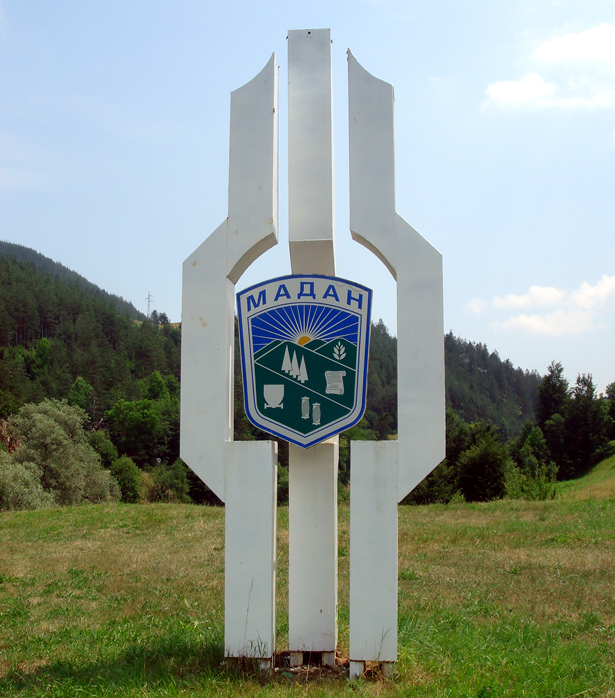 Crest of Madan at the entrance to the town. T. Praszkier photo. 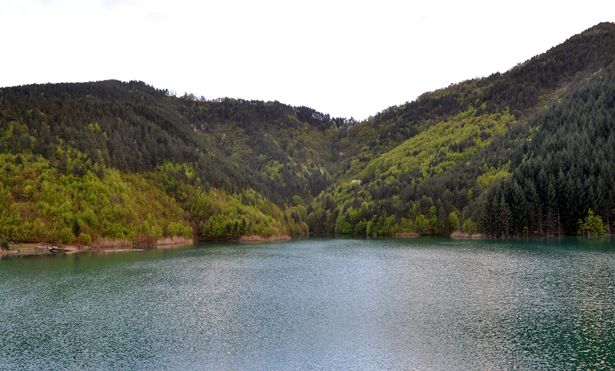 General view to teh center of Madan. J. Gajowniczek photo. 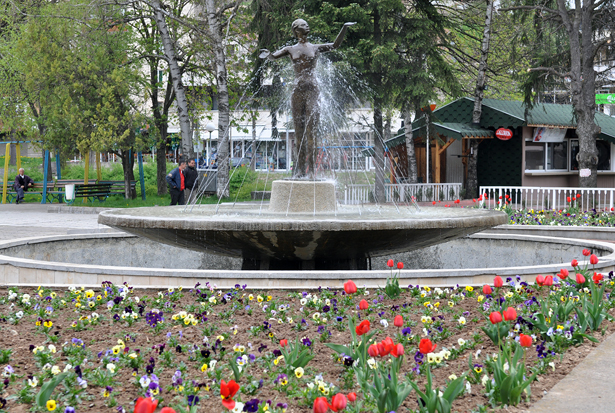 Fountain in the center of Madan. J. Gajowniczek photo. the town connected to the mining industry. J. Gajowniczek photo. 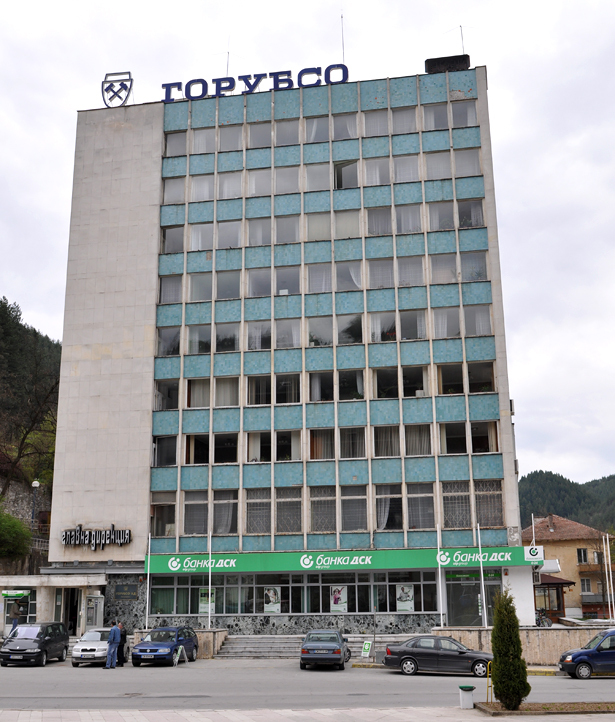 The biggest building in the town - Gorubco`s (maining company) main office. J. Gajowniczek photo. Interesting "monument" at the entrence to the Gorubco building. J. Gajowniczek photo. 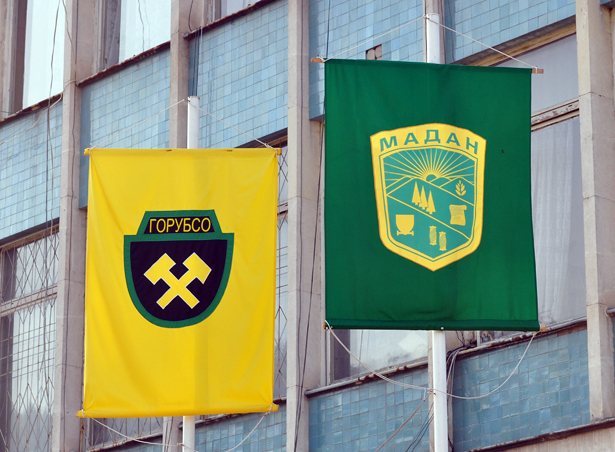 Flags with Gorubso and Madan crests. J. Gajowniczek photo. 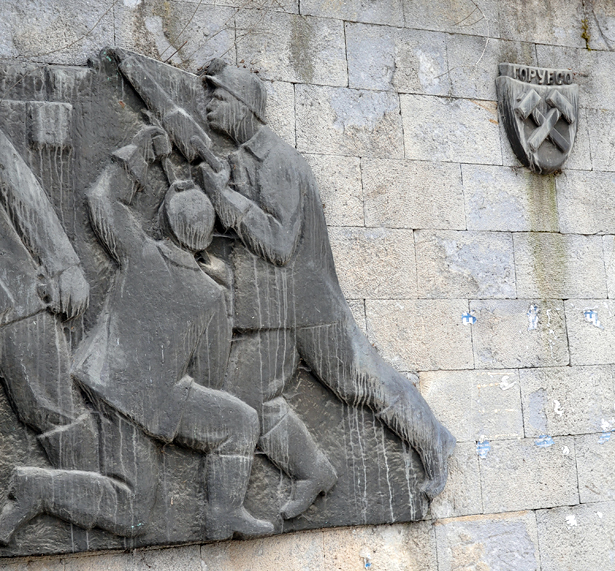 Socialist-Realist mining art on the main square. J. Gajowniczek photo. 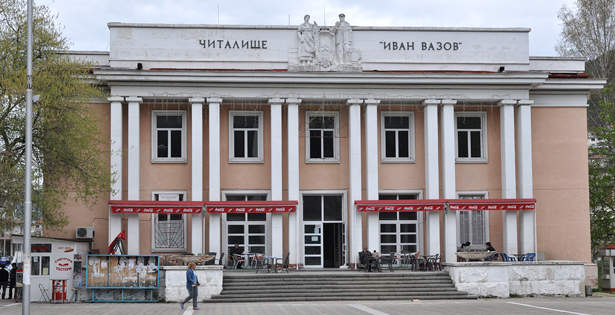 Main library in the center of town was also built in the times of development of mining in the area. According to communistic ideas it was planned as a pleace of education of the working class. J. Gajowniczek photo. 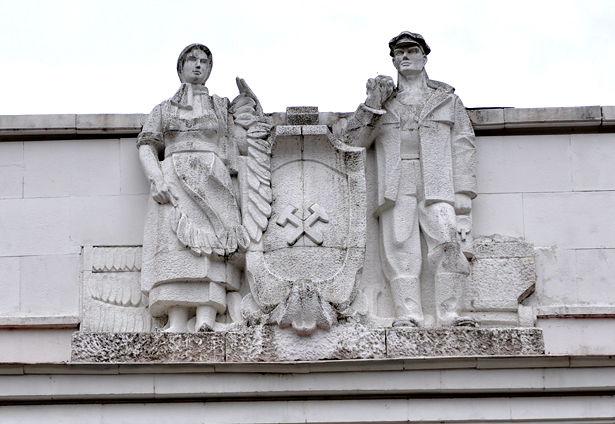 Socialist-Realist sculptures on the fronton of library. J. Gajowniczek photo. 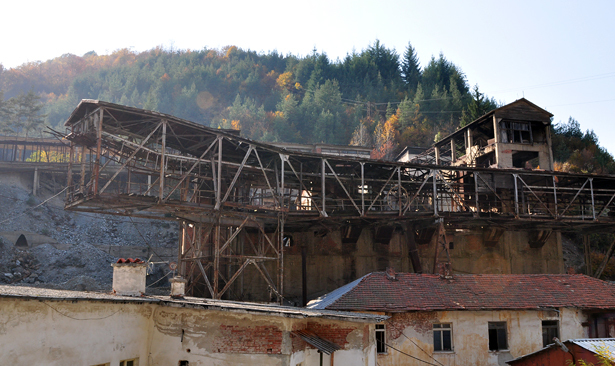 Another curiosity of Madan - just above the main market there is one of the mine adits. J. Gajowniczek photo. Adit to the main "Cpolka" - just in the middle of the town. J. Gajowniczek photo. 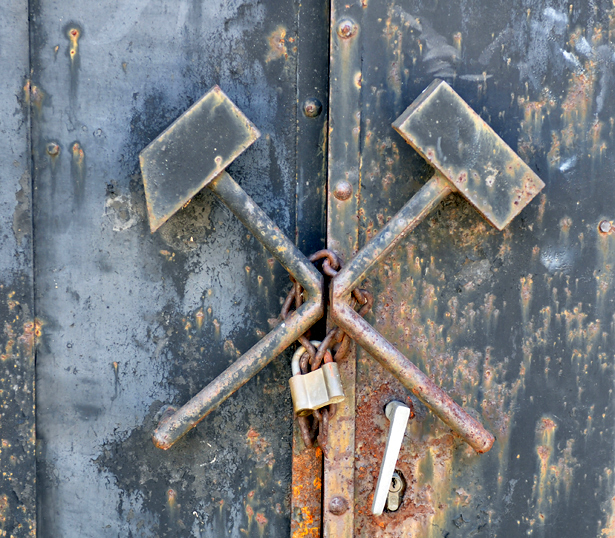 Detail of the door to the "Cpolka" mine. J. Gajowniczek photo. 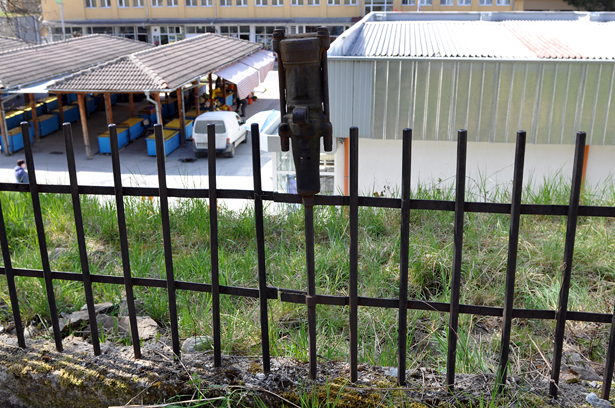 Interesting fence around the mine adit - built of mine perforators. J. Gajowniczek photo. 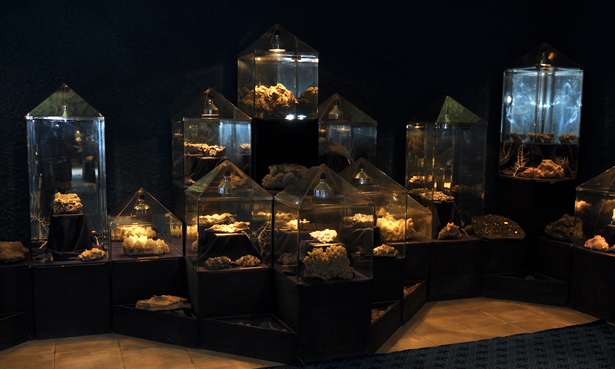 At the entrence to the "Crystal hall" - mineraogical municipial museum. J. Gajowniczek photo. 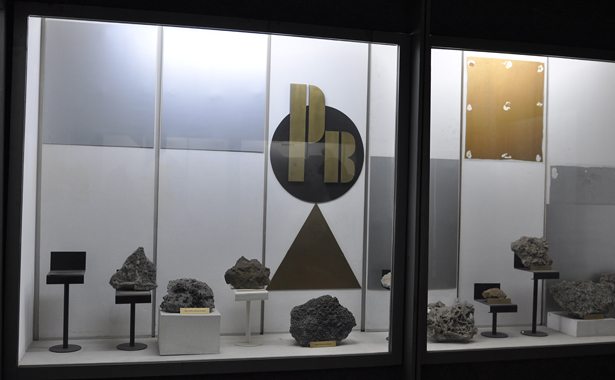 Showcases in the museum. J. Gajowniczek photo. 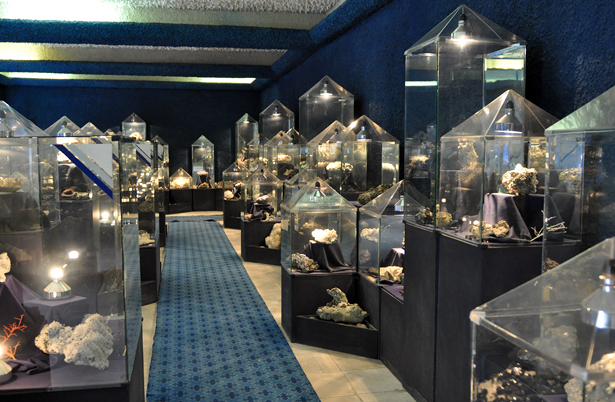 Some old specimens from Madan area on the exposition in museum. J. Gajowniczek photo. 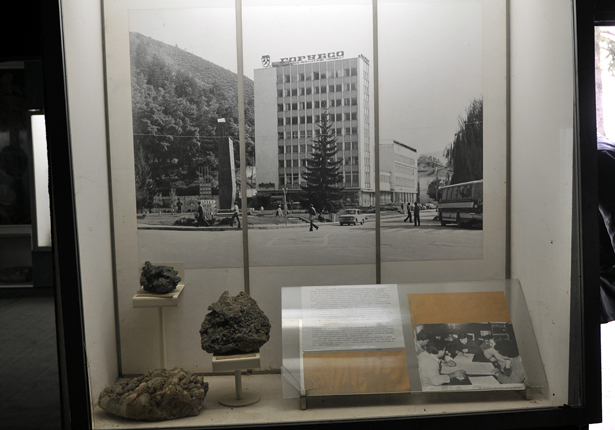 Huge specimen from 9th Sebtember mine on the exposition in museum. J. Gajowniczek photo. Another huge specimen on the exposition in museum. J. Gajowniczek photo. 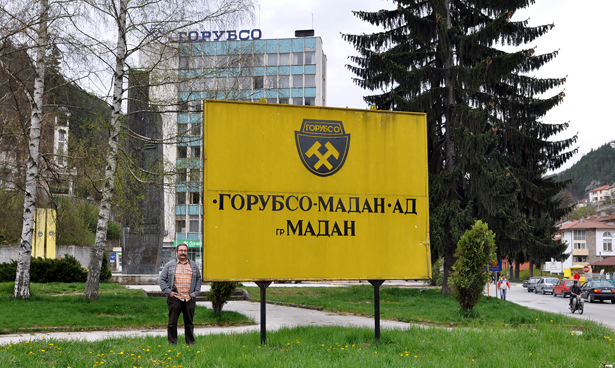 Another interesting museum in Madan is museum of "Miners` work" – classic communistic museum, today a real hearitage park. It might be difficoult to understand how funny it all looks today for the people who do not know how it was to live in the communist times. 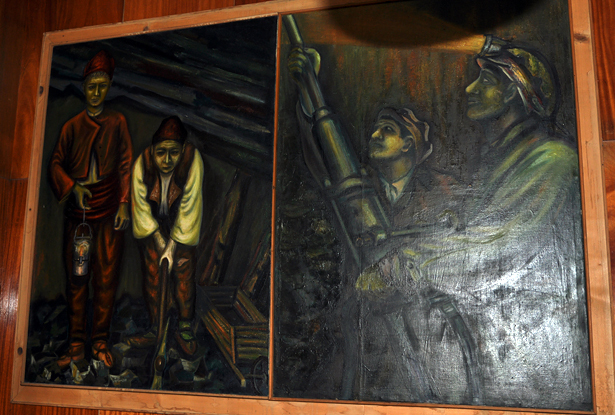 In the pciture - two big Socialist-Realist oil paintings showing ancient and recent miners` job. J. Gajowniczek photo. 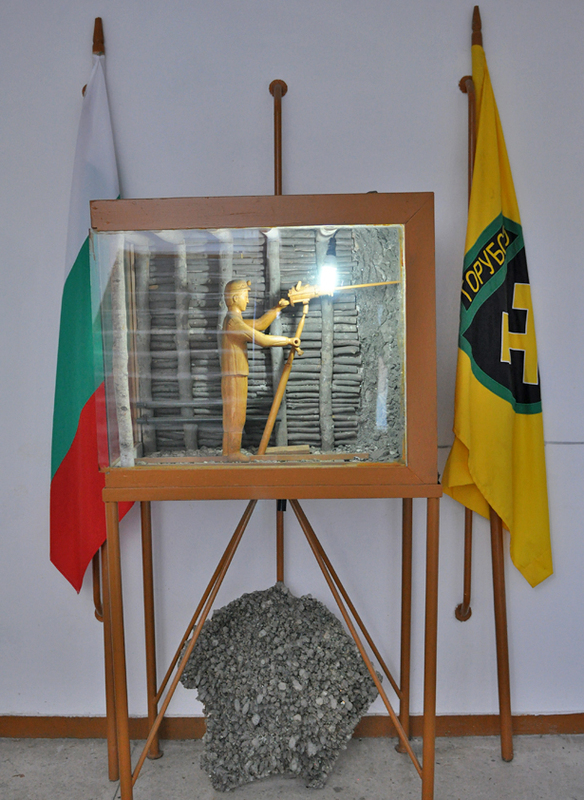 Part of the exhibition in museum of "Miners` work" – minerals which contain lead (Pb). J. Gajowniczek photo. 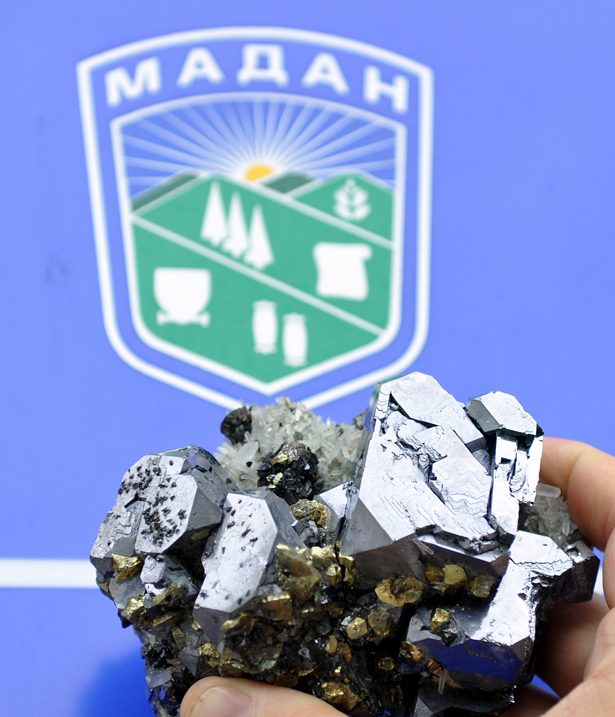 Big bass-relief with the main elemts mined in the Madan area. 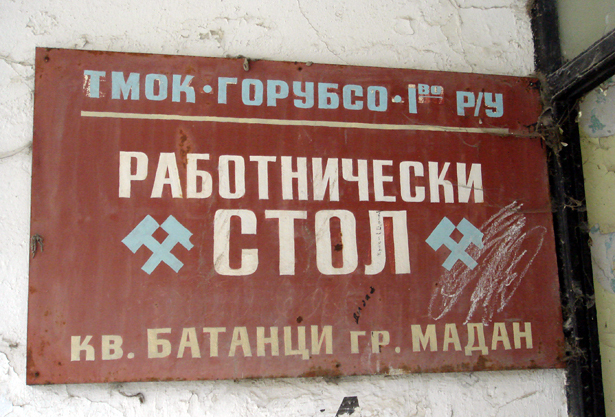 Note at the right side red, communist banners with sickle and hammer symbols. J. Gajowniczek photo. Another interesting showcase. J. Gajowniczek photo. Next 3 pictures show "5-year plans" - communist 5 years plans of metals production and volume of mined ore (more about 5 year plans see here). Of course this kind of plans existed only on paper and were fiction. Kind of symbol of communist economy. J. Gajowniczek photo. Another showcase about 5-Year Plans. J. Gajowniczek photo. 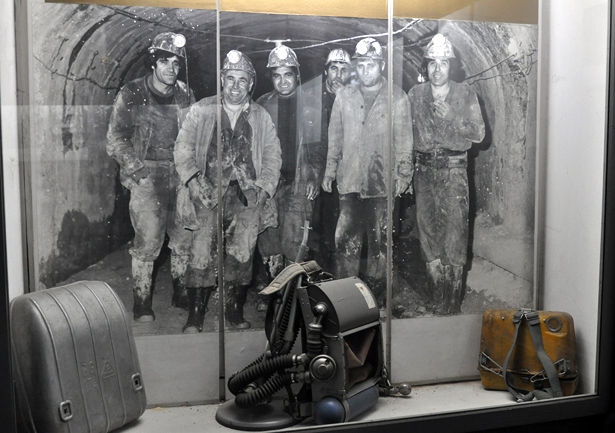 Showcase with an old photo of miners, rescue teams` absorbers in the front. J. Gajowniczek photo. 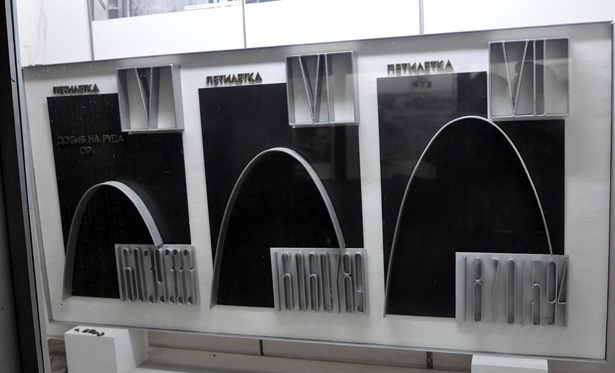 Leaving museum of "communism" - another interesting story about Madan minerals. 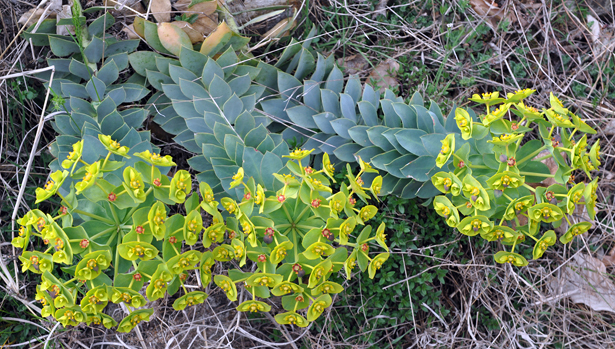 Low quality specimens are used for production of suvenires (really ugly ones) for tourists. 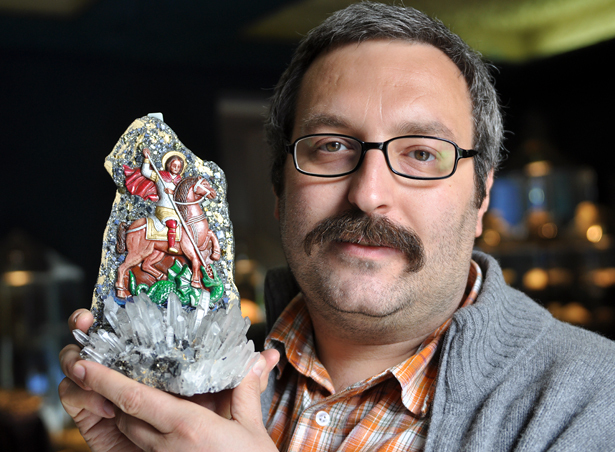 Here St Christopher fighting with dragon on quartz crystals and with "galena sky". J. Gajowniczek photo. 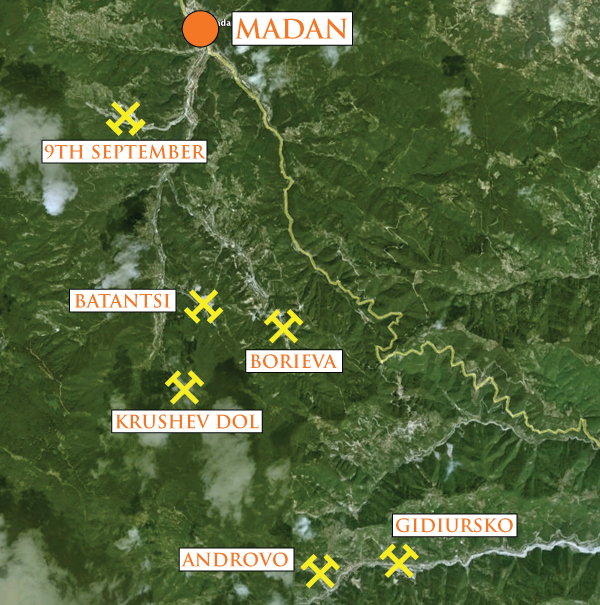 Map of most important mines producing specimens in the Madan area. Map from Google Earth. 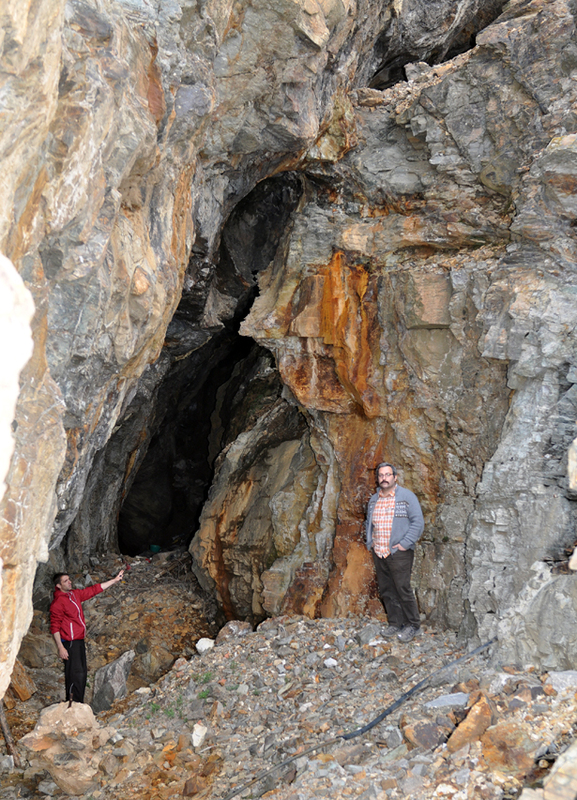 Area near the closed 9th September mine - famous for cleiophanes, epitaxial growing sulphides and many others great specimens. J. Gajowniczek photo. 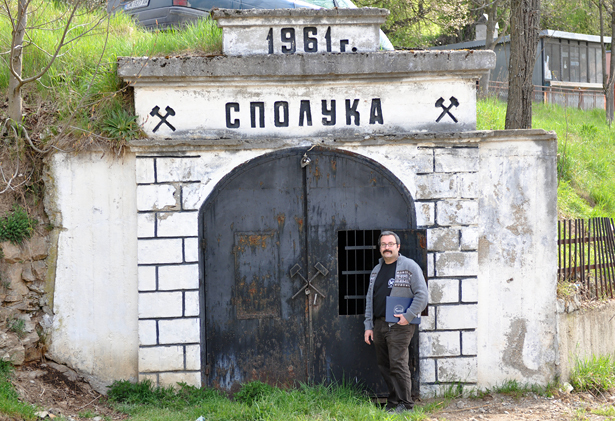 With the local friend Ivan at the old entrence to Osikovo section of 9th September mine. J. Gajowniczek photo. 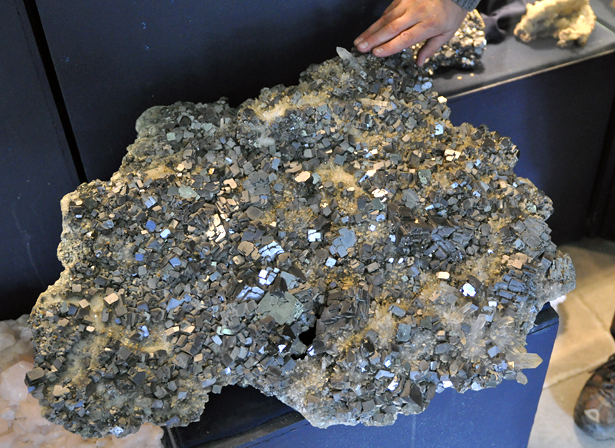 Galena with quartz – mineralization is visible on the surface in many places in the 9th September mine area. 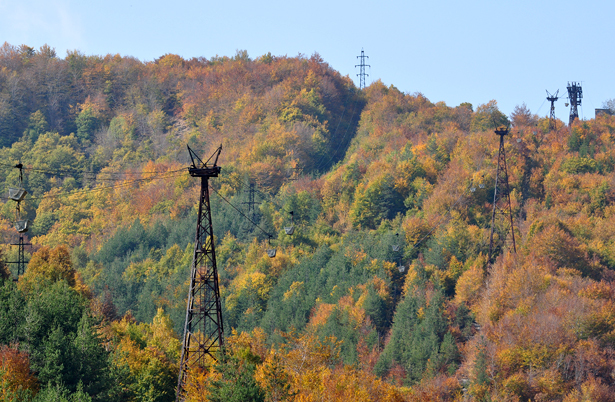 A picture from the previous trip (in Autumn) of aerial tram way crossing mountains and going from Madan to Rudozem - over 6 km long. T. Praszkier photo. Tower of the aerial tram way. T. Praszkier photo. 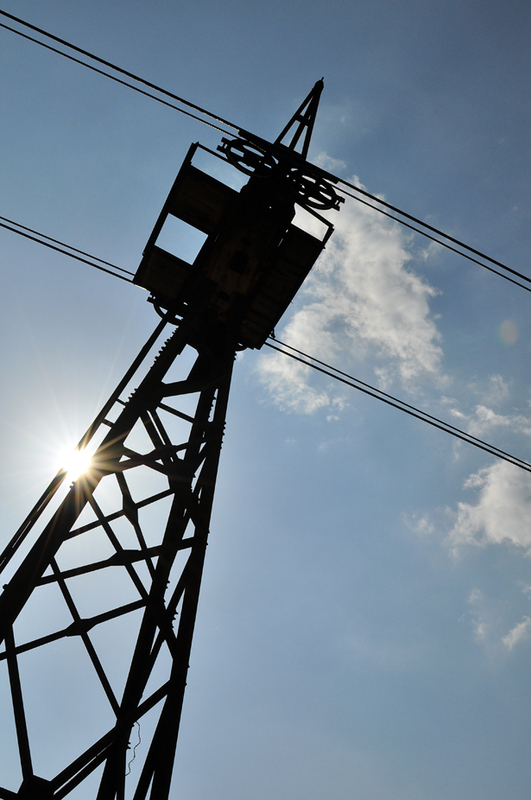 Tower with wagoons of aerial tram way. T. Praszkier photo. 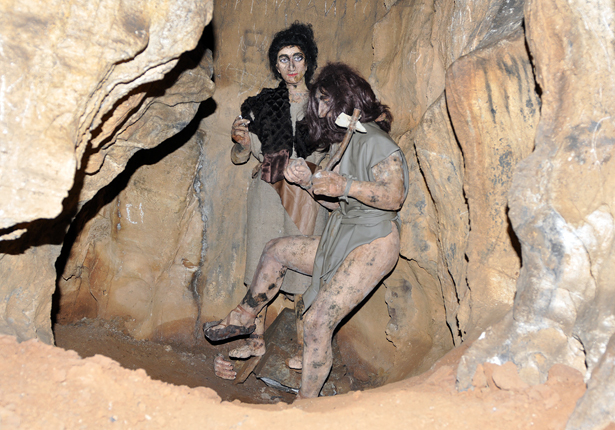 A small cave with traces of prehistorical habitants is located near the 9th September mine. J. Gajowniczek photo. 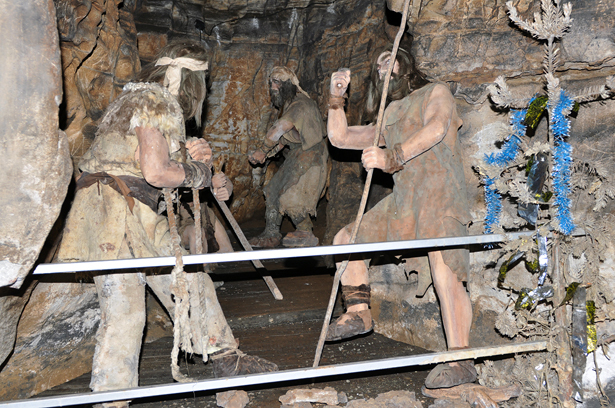 Quite funny exhibition in the cave. J. Gajowniczek photo. 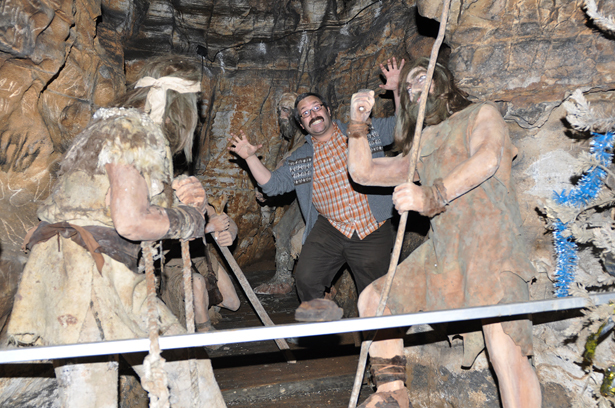 Quite funny exhibition with one extra alien in the cave. J. Gajowniczek photo. Beautiful landscapes around village Sharenska near the 9th September mine. J. Gajowniczek photo. 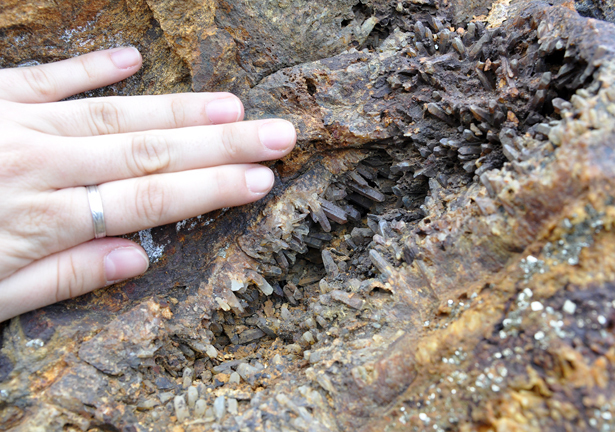 After visit the 9th September mine area we came back to Madan to see some specimens. J. Gajowniczek photo. Specimens at one of the locall dealers place. J. Gajowniczek photo. 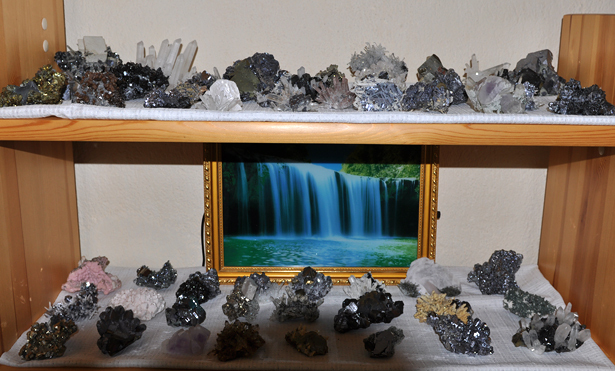 Privat collection of one of the local miners. J. Gajowniczek photo. 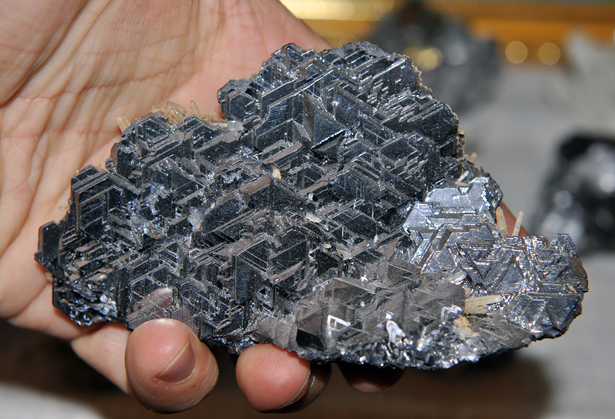 Great spinel law twinned galena crystal from Krushev Dol mine. J. Gajowniczek photo. Superb japan law twinned quartz. J. Gajowniczek photo. 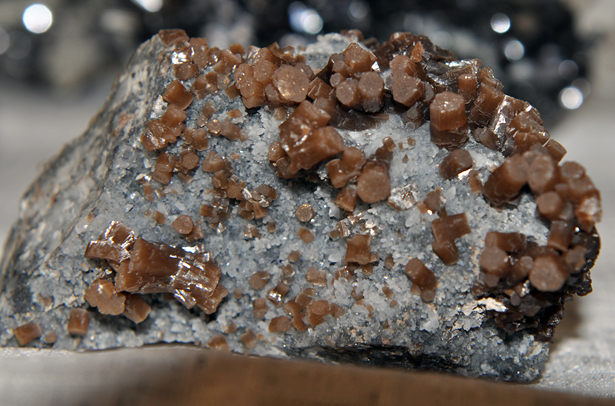 Old pyromorphite specimen from other Bulgarian locality – Pcheloyad mine (exhaused). J. Gajowniczek photo. 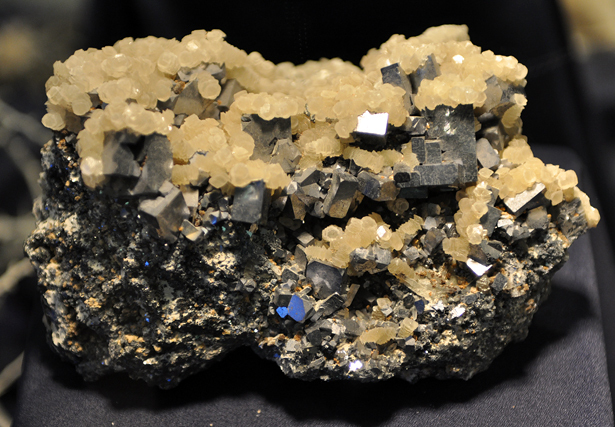 Specimen offered by one of the mines. J. Gajowniczek photo. 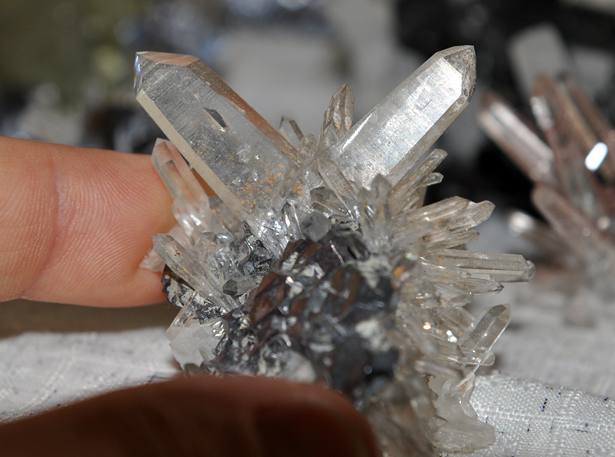 Interesting heavily etched galena crystals. J. Gajowniczek photo. 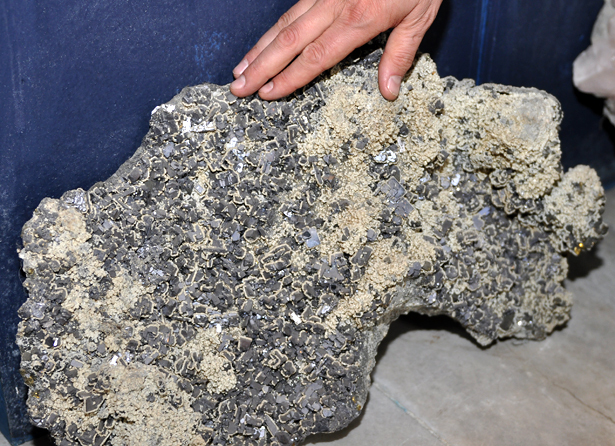 Enormous pyrite cube – unfortunatelly heavily damaged. J. Gajowniczek photo. 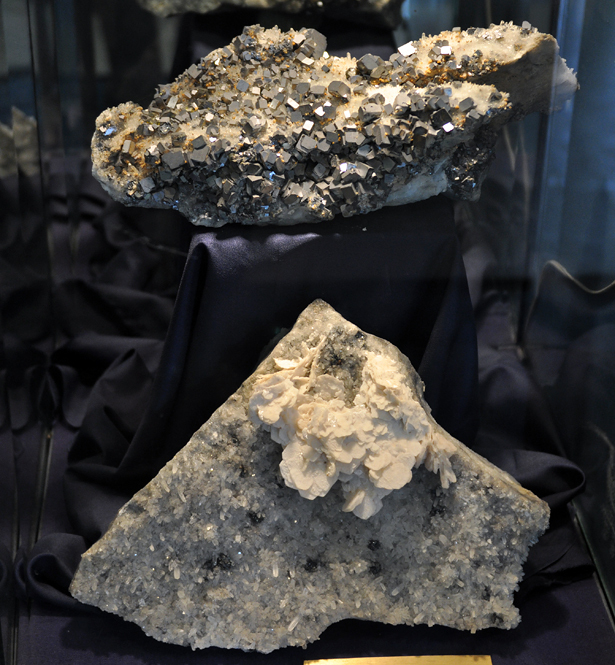 Madan crest with galena and chalcopyrite specimen. J. Gajowniczek photo. From Madn we went agian to visit the mines. 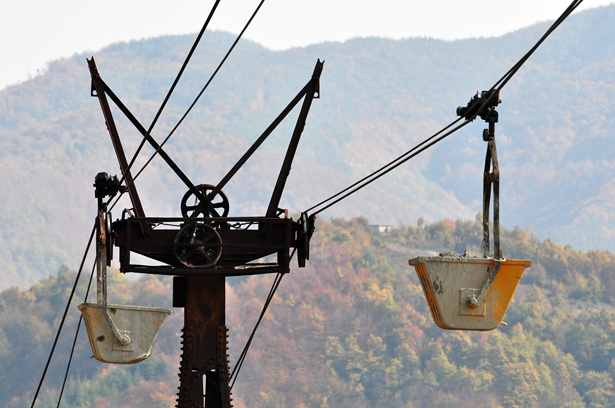 Here is the view to the head frame of Petchinsko mine – it can also be considered as a monument of communism. When they just finished building the main shaft and hit the zone reach in ore they... left the mine. Small sign at the left side says "Hole for dead bodies" – intetesting idea of storing dead animals... You can imagine smell around! J. Gajowniczek photo. 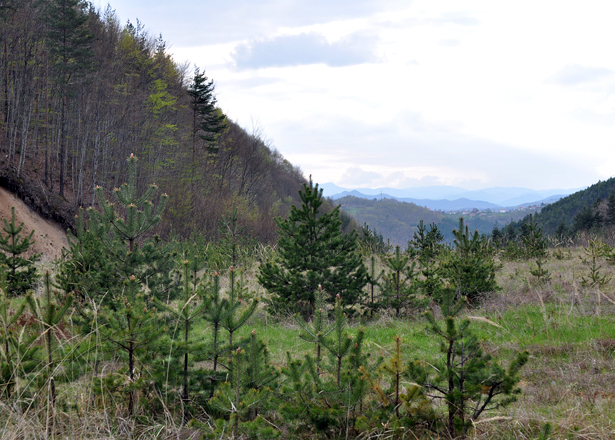 View from Petchinsko mine to the Rhodopy mountains. J. Gajowniczek photo. Old workings in the Strashimir vein. J. Gajowniczek photo. 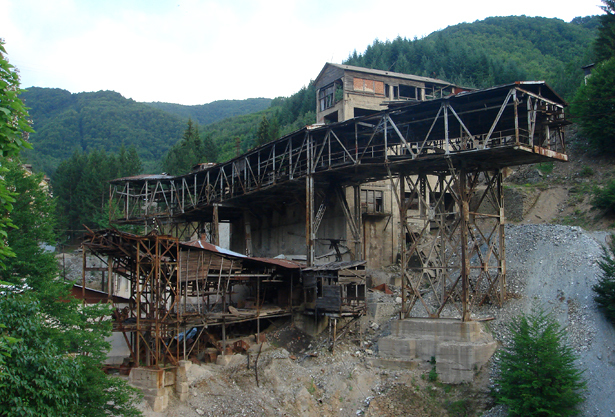 One of the oldest mines in the area – Nadiejda (Hope) mine located in the Strashimir vein. Huge, surface workings in the Strashimir vein. J. Gajowniczek photo. Incredible narrow rift - the result of removing the ore from host rock in Strashimir. J. Gajowniczek photo. 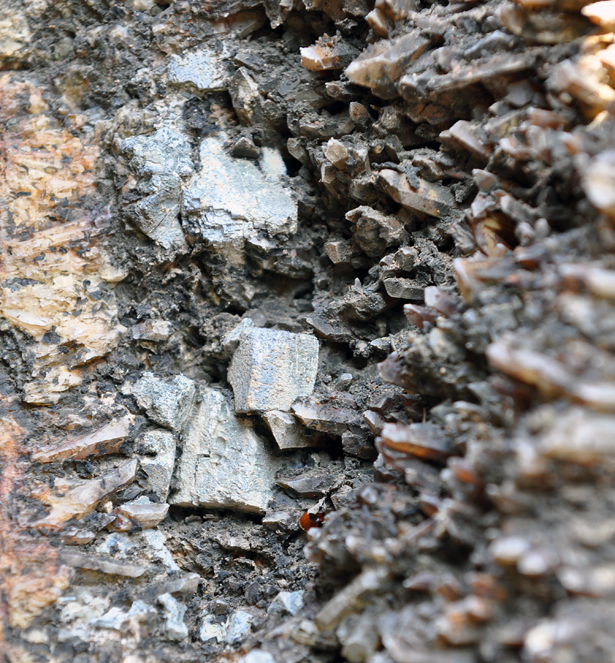 Oxidized ore vein visible on the surface – Strashimir vein. J. Gajowniczek photo. 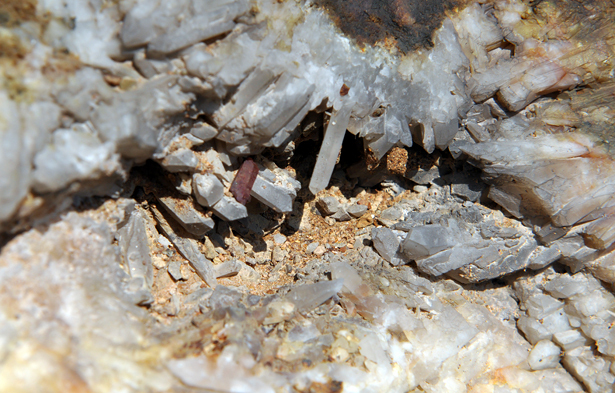 Small quartz pocket in the Strashimir vein. J. Gajowniczek photo. 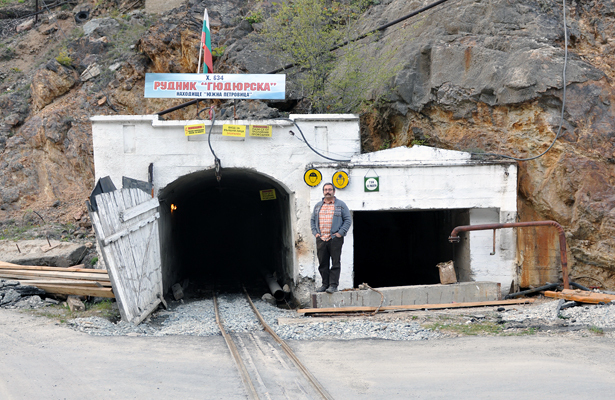 Our next trip was to W-E trending valley were the mines Androvo and Gidiursko are located. Map from Google Earth. At the beggining of the valley one can see small, beautiful lake... J. Gajowniczek photo. 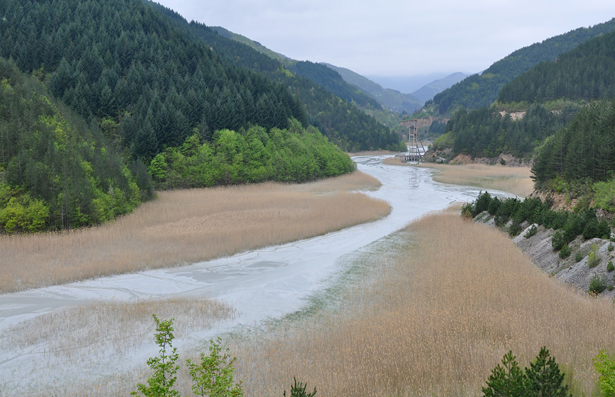 ... but moving up the valley you will soon realize that this is sedimentional tank were ecollogically danger sediments are accumulated. Muddy river transporting the wastes from the flotation process flooded also one of the old shafts J. Gajowniczek photo. 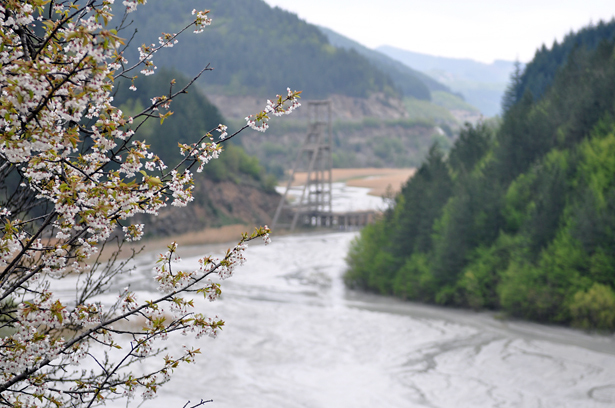 Blooming tree with old shaft flooded by the flotation wastes. J. Gajowniczek photo. 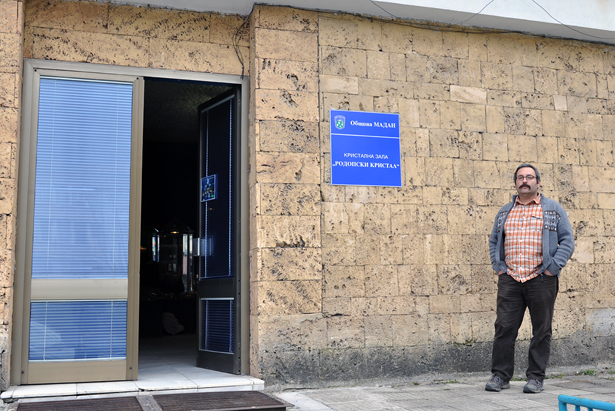 Perpetrator of the pollutions in the area – mining center in Erma Reka. J. Gajowniczek photo. here in photo and... J. Gajowniczek photo. 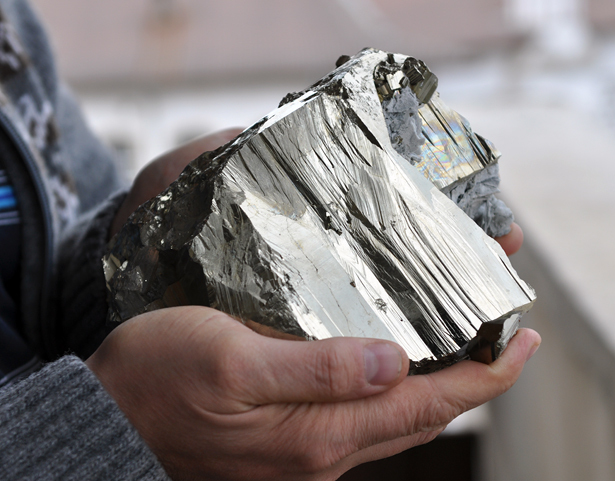 ... Gidiursko mine - one of the most importontant sources of top quality galena specimens in the world. 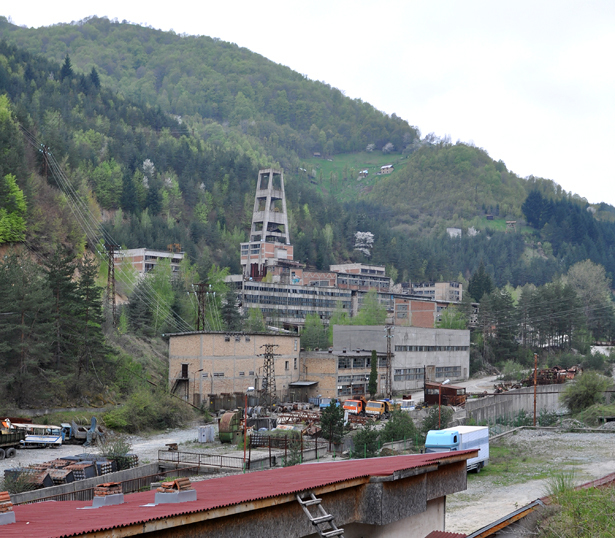 Last part of our trips in Madan area was the valley located South to the town were the mines Borieva, Batansi and Krushev Dol are located. 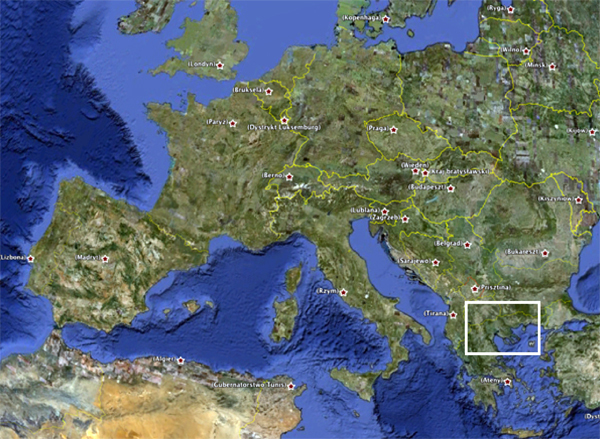 Map from Google Earth. 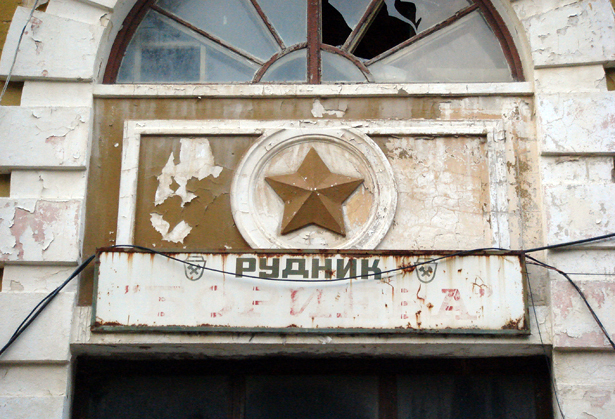 Red communist star with inscription "Rudnik (Mine) Borieva" above the door to the managment of the mine. 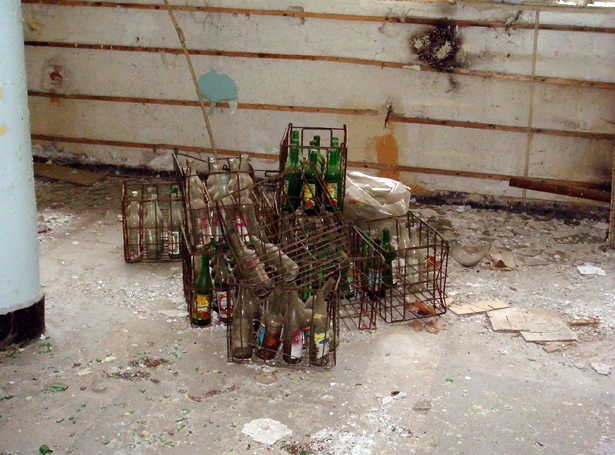 You will be surprised – this is not an industrial area after nuclear attack – this is an active (sic!) 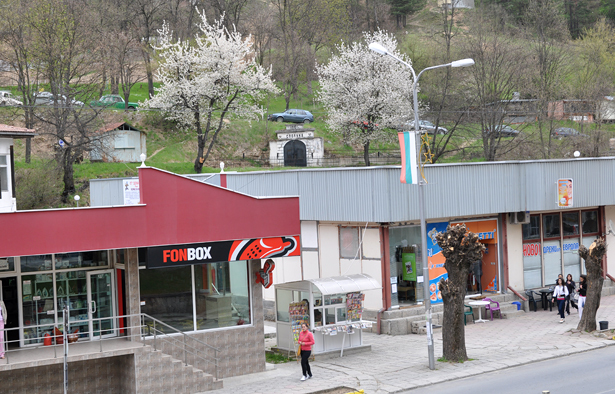 mine Borieva. 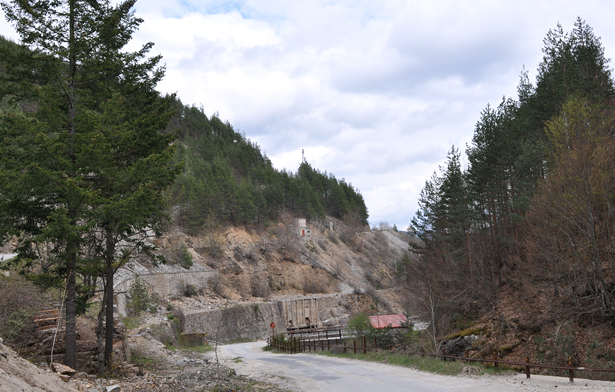 Another view to the Borieva mine. J. Gajowniczek photo. Another important (closed today) mine is Batansi – famous for great rhodochrosite. 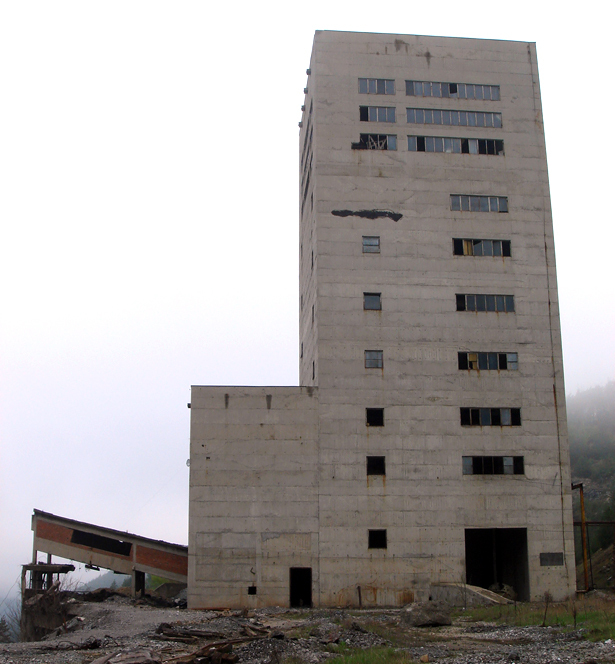 Today the mine building is a kind of ruined concrete monster... J. Gajowniczek photo. 4242 cubic meters of concrete etc to build it... Another ugly monument of the old times. 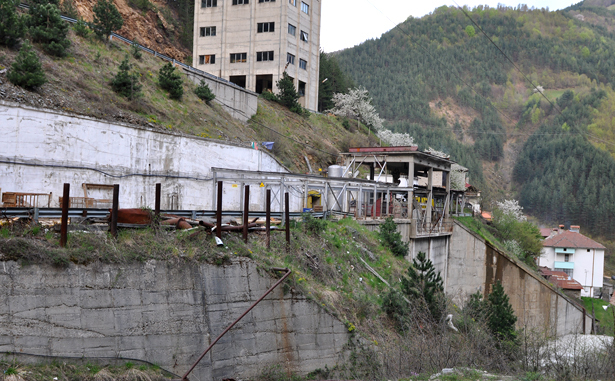 One of the mine adits in Batansi. J. Gajowniczek photo. 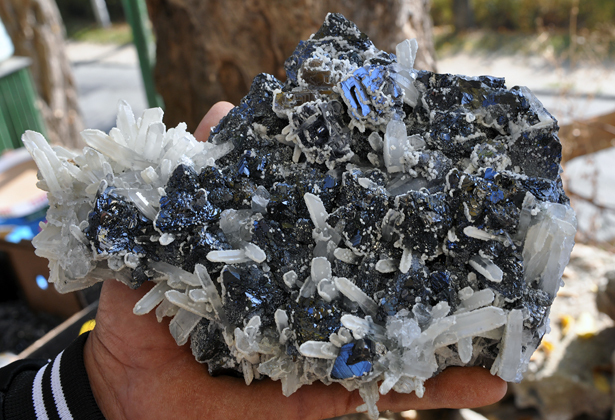 Galena with quartz on the dump in Batansi. J. Gajowniczek photo. 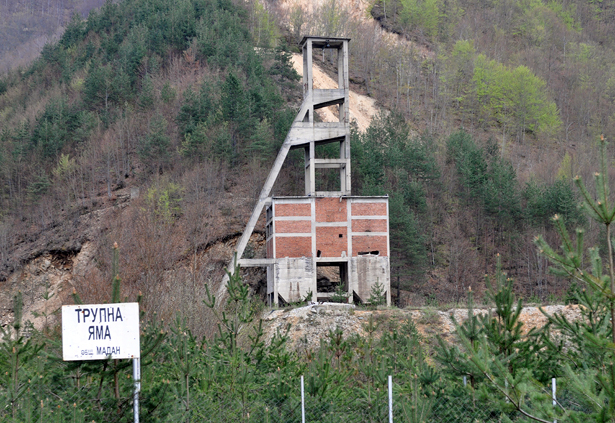 Going to the Krushev Dol mine one can see another interesting building... J. Gajowniczek photo. 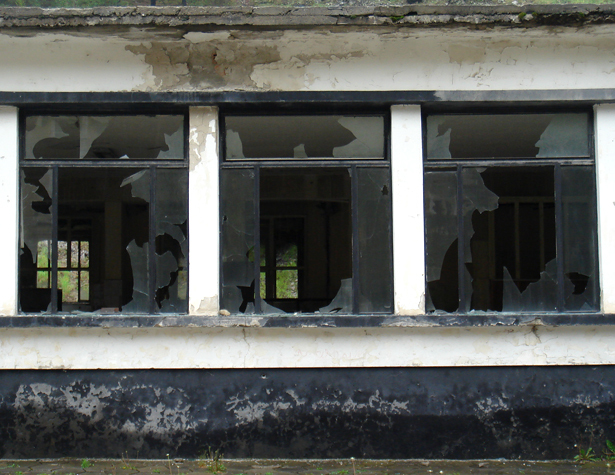 ...with unusual windows pattern... J. Gajowniczek photo. ... and furnishing. J. Gajowniczek photo. 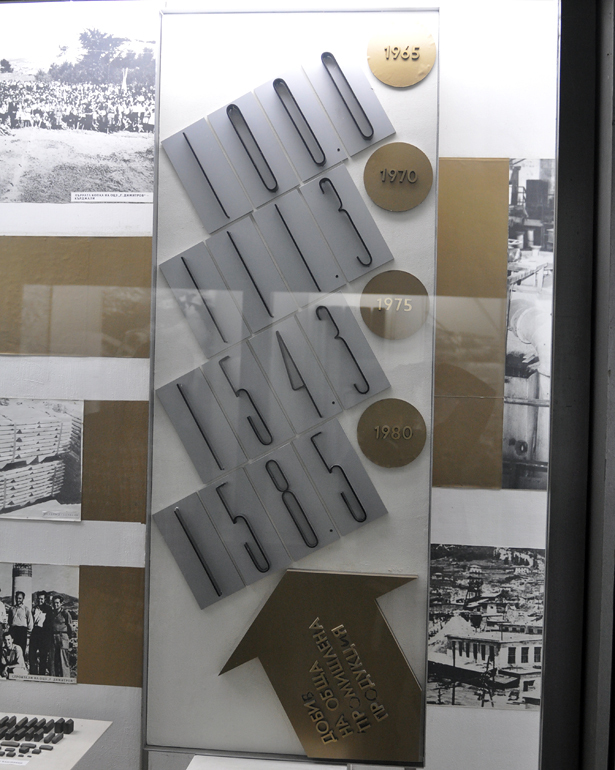 Plate located at the entrance will explain you that this is "Workers` Canteen". Hungry? J. Gajowniczek photo. 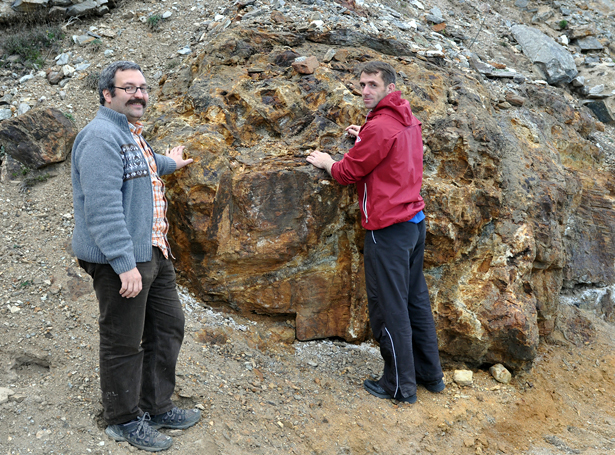 I am happy you like our reports, unfortunately in Poland there is also not too many localities for minerals (actually now there is only one really good one - Strzegom), it was great when the Romanian mines worked, only 12h drive from us, but now Madan is the closest region with very good minerals. I have sent you the combined invoice. 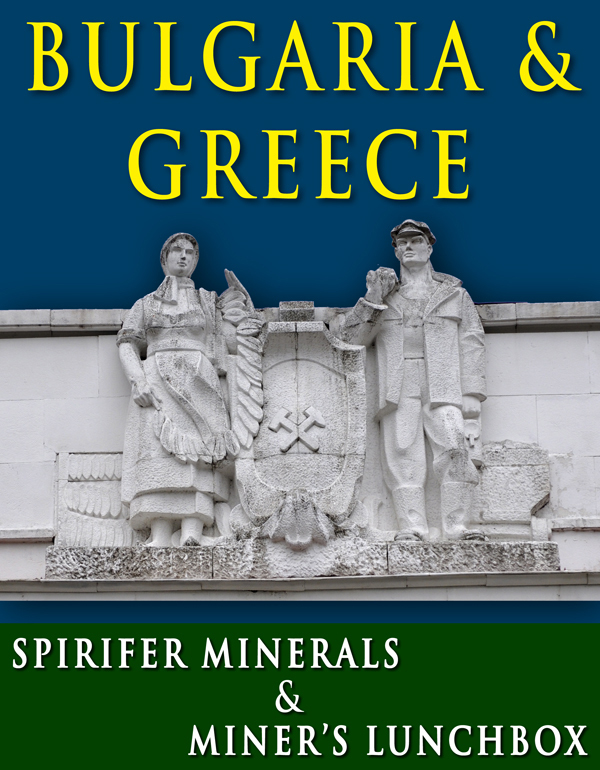 Hope you`ll like the speicmens!